Music will continue to be available in OneDrive according to the support page, and Microsoft encourages users to use the Groove Music app for PC, Xbox, or Windows Phone to play it. On December 1, 2018, the Groove Music iOS and Android apps will be retired. Your personal music files will continue to be available in OneDrive. You can keep listening to those files, and your playlists, with the Windows 10 Groove Music apps on PC, Xbox, or Windows Phone. 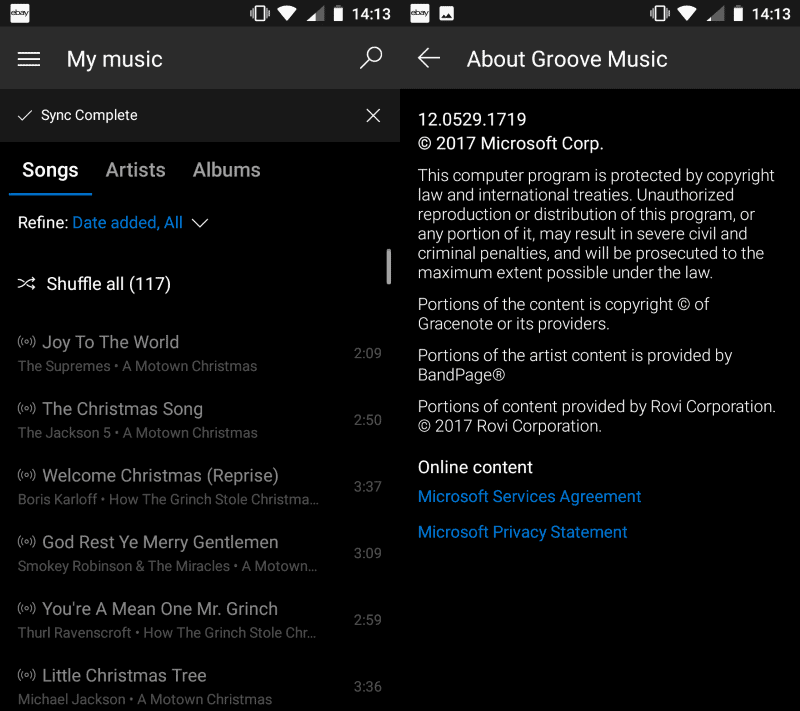 As far as playing music on Android or iOS is concerned, Microsoft suggests that users play music through the OneDrive application or switch to Google Play Music or iTunes Match to do so. OneDrive is available as an application for iTunes and Android but it is a file sync and storage solution first and foremost. While it supports playback of media, it is not as well suited for that than dedicated applications to play music on mobile devices. Microsoft put an end to its own music offerings in Windows 10 when it retired Groove Music Pass and limited the Groove Music application by removing support for streaming, purchasing or downloading music. Grove Music is still available for Windows 10 devices but it remains to be seen for how long this will be the case. Grove Music was updated regularly by Microsoft whereas the applications for Android and iOS did not receive as much attention from the company. Still, Grove Music for Android has a solid 4 out of 5 star rating and more than one million installs on the platform. The current version of Groove Music does not inform users yet about the upcoming retirement of the application. Now You: Do you use music apps on your mobile devices? Probably because the desktop one lost its purpose so this gives even less reason for a mobile one to exist. I think Groove for mobile was Microsoft still thinking they can have a piece of the pie and acting arrogantly(not humbly like they should have) about it. I’m not used to purchase music from silly apps so even the default player on my Huawei Android 5.x.something is sufficient enough for me. Typical Microsoft: late to the party, spends massive amounts of money to raise a big project without proper research, gets massive projects off the ground, loses interest, mostly ignored by the market, massive project now languishes in limbo, massive project killed off. Boo hiss. Zero elves given for MS’s software since release of Crapdows 10. It wouldn’t have been entirely ridiculous for it to match your music collection with its licensed cloud offerings so you could play a simulation of your PC’s collection on Android or iOS app (Monetized for those platforms by ads) even if you didn’t have enough storage room on your phone or tablet to fit your collection, or if you didn’t want to manually sync them with wires everytime you got a new song on your PC. I don’t think they offered that, but it’d be the sort of relatively extension that makes sense- like having an Edge browser for Android and iOS so that you can sync your bookmarks and use if you are really into the brandnname, but which is otherwise a fairly modest application that is mainly just a different shell for the default web browsers on those systems. The problem, of course, was that Microsoft decided that this Groove thing was going to be its Spotify. An operating system doesn’t need a paid subscription based music streaming service. It also has several better established competitors in that marketspace- Spotify, Pandora, etc.. iTunes even became a combination local based music player for PC and subscription streaming service during the last few years. Reducing Groove to just being a Windows Media Player replacement with a cooler name and more modern UI probably correctly repositions it as what it should have always been. It won’t be a huge money maker for the company, but it checks the box they need to check as a core app included with the operating system that one can choose to use out of the box without ads or downloads and installation or whatever, just like Windows comes with a text editor, a file manager, a web browser, a calculator, a clock, etc.. If they do ever wind uo doing Windows as a service for a monthly fee, it’d make sense to bring something like this back to try to create a sense of value in the same way that Amazon Prime throws in video and music services that aren’t really as good as their competitors, but do offer a way for people to say “Well, at least I’m getting some extras with this stupid paid subscription.” the same way they do with Prime, and use them as a no extra charge alternative to the separate monthly bill services they can’t afford or don’t want to pay for, or to supplement what they do pay for. But I’m not paying a monthly fee for my operating system, and I don’t think most people will, so it’d be a small good idea tied in with a much larger bad one.